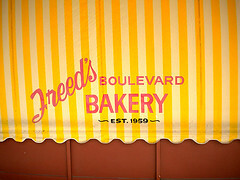 We ran off to get married in Vegas and I was afraid we were going to miss out on the cake part of the day until somebody tipped me off to the existence of Freed's Bakery. They made wedding cakes, cupcakes, cookies, Italian pastries and, much to my delight, sell individual slices of wedding-y cake. There are two locations and I was so distracted by our crazy taxi driver that I cannot remember which one we ended up at. We got our slices of cake to go while our taxi driver was nice enough to wait for us and the bakery included plates, forks and napkins for us. I can highly recommend getting the cake to go and finding a romantic spot to eat it. We had dinner plans later so we ate our cake at the Bellagio at a comfy little table in a hallway which overlooked the pool. 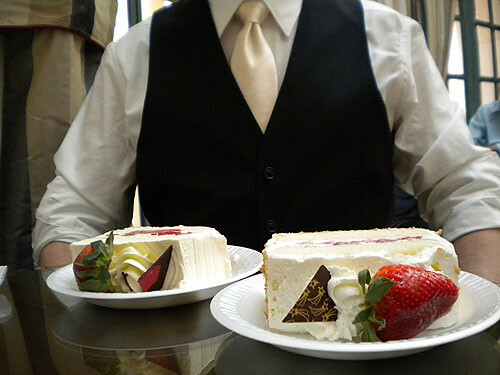 There were a few flavors of cake slices to choose from including carrot cake and a chocolate cake but we ended up two slices of vanilla cake with strawberries, one with buttercream frosting and the other with whipped cream frosting. Both were delicious, and I think this is the best buttercream I have tasted so far. I'm not usually a fan of buttercream as I find it alternately too sweet or gritty or slimy, but this was fantastic. It was whipped light and had a nice balance of butter and sweetness. 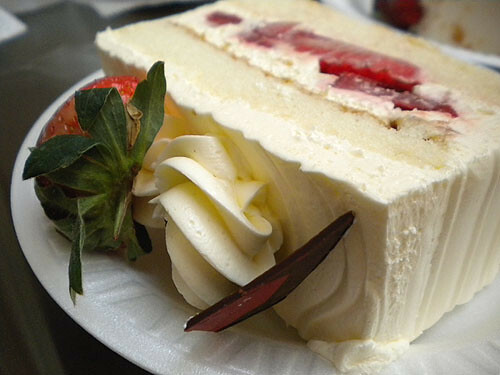 We ate our cake near the Jean-Philippe pastry shop in the Bellagio which is amazing. There is a floor to ceiling chocolate fountain that has dark, milk and white chocolate cascading down from pool to pool. (Sadly, it's behind some clear plastic walls so you cannot sneak a taste.) 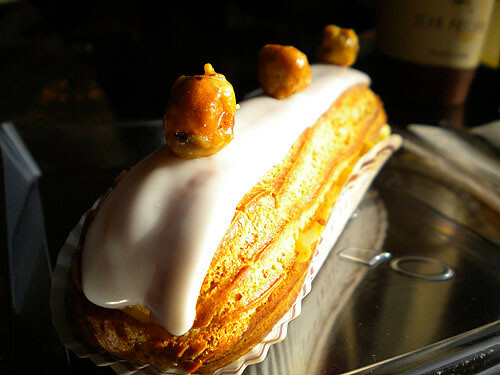 We returned later in the week to try something from Jean-Philippe and split an incredible vanilla and hazelnut eclaire. The plastic utensils at Jean-Philippe had a reflective silver finish which was a lovely touch. 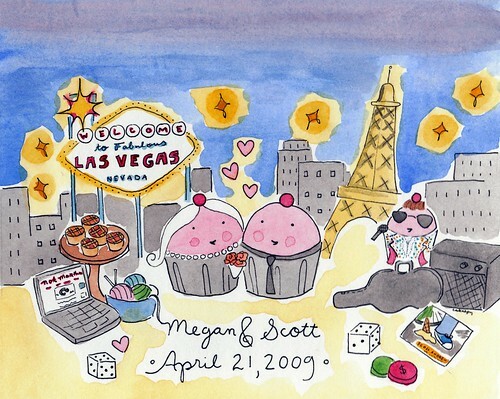 Congratulations again to Megan and Scott! Paid Advertisement Link: Wedding Packages in Vegas!